The authors studied 33 patients who presented saddle nose. Treatment was done through implantation of homogenous cartilage graft conserved in absolute alcohol. Homogenous cartilage graft occurred in 11 patients (30%). Four patients (12%) showed implant fracture. Ali implants in the collumelar region underwent complete resorptum. After three years a resorption of 30% was noticed in the homogenous cartilage grafts implanted in the nasal dorsum. O autor estudou 33 pacientes que apresentaram nariz em sela. O tratamento foi realizado com a inclusão de enxerto de cartilagem homógena conservada em álcool absoluto. O enxerto de cartilagem homógena foi colocado em 11 pacientes (30%). Quatro pacientes (12%) apresentaram fratura da inclusão. Todos implantes na região columelar sofreram completa absorção. Após três anos, 30% das inclusões no dorso nasal foram reabsorvidas. Facial deformities are frequently subject to plastic surgeon's studies. Bone and cartilage grafts, hydroxyapatite, and silicon have been utilized with relative success for the correction of the most different deformities. O'CONNOR & PIERCE(7) in 1938 were the firsts to suggest the use of cartilage preserved in merthiosaline. 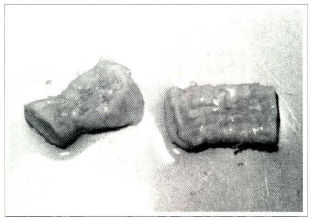 CRUZ(1), in 1986 initiated the use of cartilage preserved in absolute alcohol for orbit floor. STRAITH(11) has reported the use of silicon for saddle nose correction. In his experience, the homogenous cartilage preserved in merthiolate presents resorption, thus making it unfeasible for clinical use. Our study intends to evaluate the behavior (resorption, infection, extrusion) of cartilage preserved in absolute alcohol, in laboratory animals and in nasal dorsum deformities. We have initially obtained the cartilage fragments from the costal region of an adult rabbit, which were kept in absolute alcohol for 30 days for material culture. After this period and negative results from the culture, these fragments were implanted in other rabbits according to the description below. 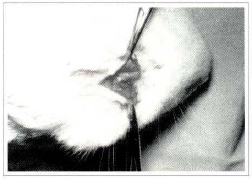 Rabbits under general anesthesia, ventral decubitus, incision in the scalp and muscle undermining reaching the periostal level. In this situation, the rabbits were divided in two groups of five and 1 cm long fragments of costal homogenous cartilages were implanted in the frontal bone of the skullcap. In the first group (S), the cartilages were implanted on the periosteum, being fixed with nylon wire 5-0 (fig.1). In the second group (P), they were implanted under the periosteum (fig.2), therefore, in direct contact with the bone, and fixed in position by a periosteum tunnel. Fig. 1. Cartilage placed on the periosteum of the rabbit. Fig. 2. Cartilage placed under the periosteum. After 60 days, fixation and size of the implants were inspected and the implanted fragments were histologically examined. Clinical observation showed that the cartilage implanted on group P (under the periosteum) kept the original length, being strongly fixed to the receptor bone in all cases. In group S (on the periosteum) the cartilage also showed original length but got lost from the receptor bone in all cases. Histologically it has been noticed that both groups presented regressive cartilage degeneration with calcification signs. The cartilage placed sub-periostically has not presented any shape/length deformation being strongly addhered to the bone cradle, while the supraperiostal cartilage fragment presented the same original shape/lenght but no osseous fixation after 60 days. From May 1990 to May 1993 we operated 33 patients with saddle nose deformities. Nineteen (15 women and 4 men) were followed-up with xero-radiography. All patients were previously informed of the experimental feature of the material implanted. The stability and fixation of the implanted cartilage were evaluated c1inically and resorption by xero-radiography. Xero-radiographies standardization were as follows: focal distance of 1.0 meter; 70 kilovolt and 60 milliampere/second. When focal distance was of 1.20 meters, kilovolt was 10 and milliampere, 60. Cartilage was removed from the 5th, 6th and 7th ribs, (after laboratory tests for hepatitis, HIV and Chagas disease being negative) without pericondrium and preserve in a glass with absolute alcohol. After a month a fragment was sent to culture and after two monts the implant was ready to use. The operations were performed under local anesthesia: 2% xylocaine and adrenaline 1:200.000. The approach was by exo-rhynoplasty, medium collumelar incision, (fig.3a) except for one case when we made the incision on a previous scar on the tip of the nose region and another case when we introduced the implant through a coronal incision after a facelift surgery. The homogenous cartilage was removed from the absolute alcohol (fig 3b) and placed in physiological serum for approximately 30 minutes when a consistency quite close to the normal cartilage was noticed (fig3c). It was later washed in new physiological serum so that the eventual remaining of the absolute alcohol could be completely removed. Figs. 3a & 3c. Transoperatory view after medium collumelar incision and undermining of nasal dorsum; cartilage implant placed in nasal dorsum and columella. Fig. 3b. Pieces of cartilage right after withdrawal of alcohol. The cartilage fragment was then modeled for adaptation to the nasal dorsum region, from the nasal frontal angle to the tip (no over correction was planned). Another cartilage fragment was placed in the columella supported by the nasal spine, to project the tip of the nose (fig 3d). The cartilage was introduced in the nasal dorsum after undermining presumably under the periosteum and then in the columella, suturing one to the other with vicryl 4-0. After clinical inspection of the position and volume provided by the implants, the surgical wounds were closed with mononylon 6-0. A "modeling" dressing was placed for 7 days. Patients were requested to return 2 days later for a follow-up and after that on days 7, 30, 180, 1, 2 and 3 years. Xero-radiographies were requested on day 30 and on the first, second and third years. Figs. 4a & 4b. Patient pre-operatory and 3 years after surgery. The patients were followed-up from 9 months to 4 years, with evaluations made by xero-radiographies (fig.4c;4d) and conventional radiographies. Figs. 4c & 4d. Xero-radiography showing calcification of the implant six months after surgery and 2 years after surgery. The immediate postoperative period was uneventful with good nasal dorsum and tip projection, without infection or implant extrusion. Although xero-radiographies showed cartilage implant calcification in 11 cases (58%), resorption was slow and progressive. Fractures in the implant happened in 4 cases (21%): one was subsequently replaced by another implant, two by silicone and the same implant was kept in one. Complete integration of the implant happened in 3 patients (16%), with no signs of resorption, while in 16 (84%) there was slight mobility. No patients presented total implant mobility as can be noticed after silicon inclusions. It was difficult to precisely evaluate absorption in 8 implants with no calcification, however, by indirectly measuring the distance from the nasal bone to the skin we could notice that there was moderate and constant resorption on 15% to 30% basis, what became evident 6 months after the implant. In 3 patients the implant was fixed, showing no resorption while in 5 it showed slight mobiliry. In patients with calcification, resorption after 6 months was of 5% to 10% from the initial volume. After 2 years resorption was from 20% to 30% in the distal and proximal portions. All implants placed in columella underwent total resorption. Autogenous cartilage grafts are indicated for correction of small facial defects with ear and septum being the main donor areas. However, the volume of cartilage supplied by these regions is small and patients, specially female, are against removal of thoracic cartilage which allows larger volumes. In view of the disadvantages presented by grafts, several studies have been carried out to get a rissue or material that can replace them, without the common inconveniences. The cartilage implants have been subject to controversies. 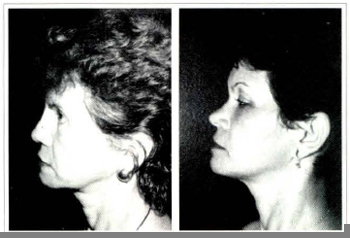 MATORY & FALCES(5) report a case of osseous graft in nasal dorsum for rhinoplasty on no-Caucasian nose, describing the relation base to height of the nose and how it should be changed in each case. REES(9) has commented on this work pointing out his preference for alloplastics (silicone) in nasal dorsum as long as they do not compel the tip of the nose, what might cause exposure. STRAITH(ll) reported good results with silicon to correct saddle nose. PONTI et al(8), have utilized an osteocartilaginous flap from the nose structure's support to correct the saddle nose (congenital and acquired). They have reported good functional aesthetical experience. The use of homogenous cartilage preserved in cobalt shows the great inconvenient of leaving the cartilage extremely hard, difficult, therefore, for handling. Preservation in alcohol has sterilized the graft, as late material cultures showed no germs growth. In our study we observed that the homogenous cartilage preserved in absolute alcohol when used in nasal dorsum suffers a slow and constant resorption process. We have tried to place the implant under the periosteum, and noticed that when it was placed by coronarian way, therefore, under direct vision of the nasal region periostal undermining, there was integration of the implant with maintenance of the volume after 3 years. Calcification of the implant occurred in 58% of the cases what, according to some authors, suggests regression and cartilage resorption. However, even with calcification these implants showed stability in some cases, while implants with no calcification showed considerable and apparently faster resorption. In some cases, however, there was total fixation of the implant to the receptor cradle while in most cases mobility, even if slight, could be noticed with smaller resorption of the implant. Utilization of the implant to project the nasal tip was not considered a good alternative since there was total resorption of the cartilage fragment in all cases. GUNTER & ROHRICH(3) have utilized septum cartilage autogenous grafts for correction of small saddle nose defects, with good results. We have also used this type of cartilage for the correction of small defects, however, for larger defects even the cartilage from the two ears is not sufficient for adequate correction of the deformity. GIBSON(2) emphasized thar cartilage implants do not present any deformation trend, what frequenrly happens with the cartilage graft. The work of STRAITH & SLAUGHTER(10) is very important as a long term follow-up. These authors have followed-up implants of cartilage preserved in merthiolate for 5 years in 49 patients. According to this study, 32% of the patients have not shown inisertion was done through mid collumelar incision. Calcification of the implanted itial volume loss. It seems to us, however, that merthiolate does not keep safe sterilization of the pieces. MIKHELSON(6) has observed good volume maintenance of cartilage implants used in 1819 cases when preserved in physiological serum under 3 to 60 centigrade temperatures. It is possible that this author was working with alive cartilaginous cells in which case this would be a cartilage homogenous graft and not an implant. Homogenous cartilage preserved in absolute alcohol implanted to correct saddle nose defects and Negroid nose, has shown calcification in 30% of the cases after three years postoperative and slow resorption of the implant, calcified or not. 1. CRUZ, G. A. 0.- Fraturas do terço superior da face. IN MANGANELLO,L.C. & BARRROS, J. J. Traumatismo bucomaxilofacial. Ed. Roca, São Paulo 1993 p.295-308. 2. 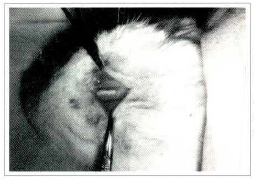 GIBSON, T. - Transplantation of cartilage in: J. M. Converse, Reconstructive Plastic Surgery. W B. Saunders Cº. 1977 pp 301-311. 3. GUNTER, J. P. & ROHRING, R. J.- Augmentation Rhinoplasty: Dorsal Onlay Grafting Using Shaped Autogenous Septal Cartilage. Plast Reconstr Surg 86:39-45,1990. 4. MANGANELLO-SOUZA, L. C. -Órbita-Fraturas Orbitais. In BARROS, J. J. & MANGANELLO, L. C. Traumatismo Bucomaxilofacial. 1a. Edição. Roca, São Paulo 1993 P309-324. 5. MATORY, JR.; W. E. & FALCES, E.- NON-CAUCASIAN RHINOPLASTY: A 16 Year Experiences, Plast. Reconstr. Surg. 77:239-251, 1986. 6. 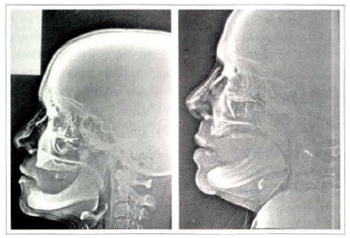 MIKHELSON, N. M.- Homogenous Cartilage in Maxillofacial Surgery. Acta Chir Plast (Praga) 4:3, 1962. 7. O'CONNOR, G. B. & PIERCE, G. W.- Cartilage Grafts. Surg. Gynec. Obstetr. 67,796,1938. 8. PONTI, L.; PONTI, G.; SERAFINI ,P.- Osteocartilaginous Flap Technique for Acquired and Congenital Saddle Nose Deformities. Plast. Reconstr. Surg. 92:431-442,1993. 9. REES,T.- Discussion. Non-caucasian Rhioplasty: A 16-year Experience. Plast Reconstr Surg 77:252,1986. 10. STRAITH, C. L. & SLAUGHTER, W. B. - Grafts of Preserved Cartilage in Restoration of Facial Contour. J. A. M. A. 116:2008,1941. 11. STRAITH, R. E. - Five Long-term Case Reports(average 15 Years) of Saddle Nose Correction Using Cast Implants. Plast. Reconstr. Surg. 88:1064-1069,1991. To the fellows of the Surgical Clinic of Santa Casa Medicai School-São Paulo. To the fellows of bank of tissue of Albert Einstein Hospital. This research was supported in part by the State of São Paulo Foundation for Research - FAPESP. I - Plastic Surgery, Coordinator of Maxillofacial Surgery of Santa Casa Medical School. II - Post graduate, Ex-resident of Maxillofacial Service, Santa Casa Medical School. Work performed in Santa Casa Medical School, Dept. of Surgery, Service of Head and Neck, Maxillofacial surgery and Hospital Albert Einstein, São Paulo, Brazil.